A mistake that many homeowners make when installing a landscape is not checking to see if plants chosen are potentially invasive. Believe it or not, some invasive plants are sold at our local nurseries because when potted or used properly behind barriers, some are downright gorgeous. It’s also because San Diego’s temperate climates allows us to enjoy plants from all over the world. I hired a reputable landscape designer and still wound up with invasive plants in my yard that I’ve been fighting for years, so I’d encourage homeowners to do their own analysis prior to executing a plan. Plus, it’s always helpful to recognize when a weed might be something to pull at your convenience or when it’s an ecological emergency. An invasive species usually evolved elsewhere and arrived in San Diego by accident or transplant. They can grow quickly because they don’t have natural predators to keep them at bay, are extremely difficult to control, and can suffocate out other plants. 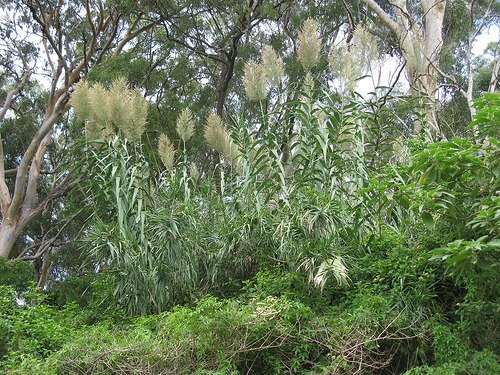 Invasive plants spread by seeds blowing in the wind wind, wildlife consumption, trampling the plant or from human foot traffic . Random fact: It’s thought that the very first invasive species hitched a ride on the boat hull of a Spanish explorer. Invasive plants pose a threat to existing native plants or even wildlife by changing the natural ecosystem. They decrease a landscape’s fire resistance and could potentially increase fire risk as native plants tend to burn more slowly. These are just 10 common, invasive plants that experts warn against using in San Diego. They are narrowed down from a long list. Pampas grass (pictured in the top photo) is certainly pretty and sold in nurseries around the county, but it’s incredibly invasive, especially on hillside landscapes. County experts recommend removal of pampas grass as soon as it’s noticed because the seeds spread easily and it can suffocate out plants intended to prevent erosion. It is especially prevalent in wetland areas, posing a risk to endangered wildlife. Seen in landscapes all over San Diego, Fountain grass is a big problem due to its ability to self-seed and spread rapidly. Its seeds even spread through storm drains. There’s a red variety, Pennisetum setaceum ‘rubrum’, that’s currently being studied for invasive properties so a determination hasn’t been made in regard to whether or not it’s suitable for San Diego. It looks sort of like a much smaller version of pampas grass. Avoid horsetail at all costs. Sure, you can plant it behind a barrier, a concrete wall or even in a planter but all it takes is for one piece of stalk to break off and seed in an undesirable area to cause a heap of trouble. Horsetail can even crawl under concrete to invade your neighbor’s yard so consider that fun fact before buying it. Speaking from personal experience–avoid it at all costs, otherwise you may have no choice but to use toxic chemicals in the yard for years in order to keep it from spreading further. 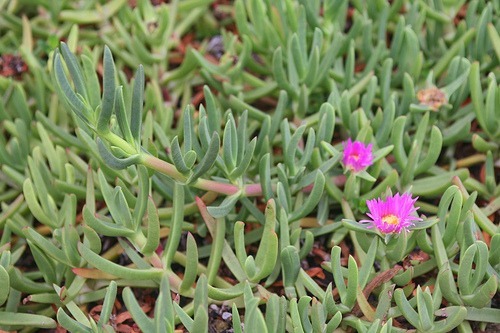 Seen on highway and neighborhood hillsides, ice plant is actually considered an invasive weed for exactly the reason why some people plant it to begin with. There’s a school of thought that ice plant leaves filled with water are an efficient way to control fires. The reality is that ice plant grows in mats and suffocates out other native plants and grasses as it spreads. Humans are entirely to blame for this one. 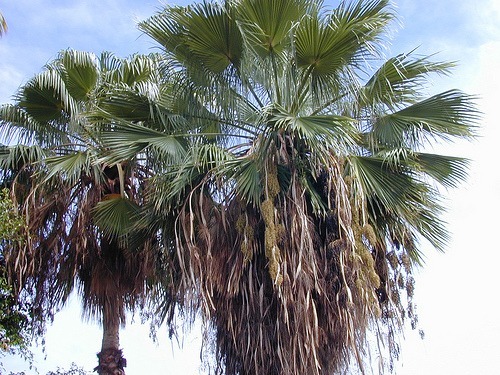 This palm tree is actually native to Baja California but was transplanted into California for ornamental reasons and can spread a massive amount of seeds outcompeting native plants once established. Thankfully, this isn’t one that’s bought commercially but it’s seen in uninhabited San Diego landscapes. We mention it to make readers aware of the risks. 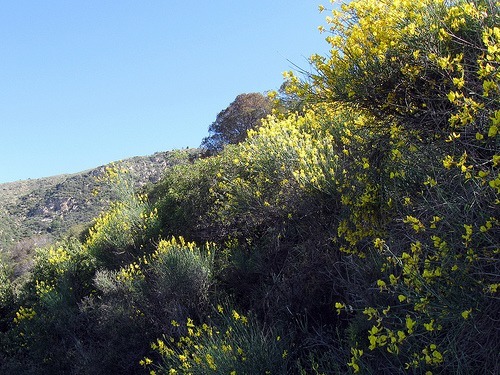 Spanish broom spreads extremely fast (with one plant producing up to 10,000 seeds in a season), suffocating out other plants along the way while creating a fire hazard as its woody stems dry out. The Canary Island Date Palm is yet another palm tree to be aware of if you see it in the wild or have it suggested as a yard option. Seeds spread as it germinates throughout the year, spread mostly by storm drains and wildlife. It is invasive throughout the county. 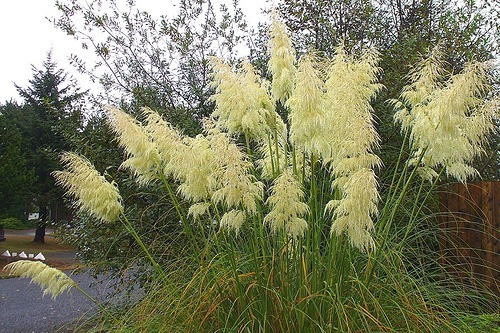 It looks like a tall, pretty grass but get rid of it immediately should it land on your property. You’ll see it mostly around river beds, growing in a clumping manner with stalks that resemble bamboo. 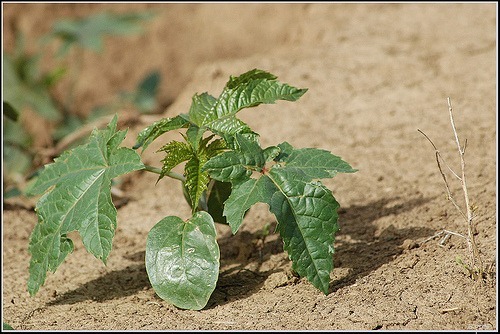 Sure, we hear about the benefits of castor oil but the reality is that castor plants should be avoided in San Diego because one plant can produce up to 10,000 seeds in a season. It’s invasive in the wild in various parts of the county ranging from Fallbrook to Solana Beach. We just found this gem on our La Jolla hillside. 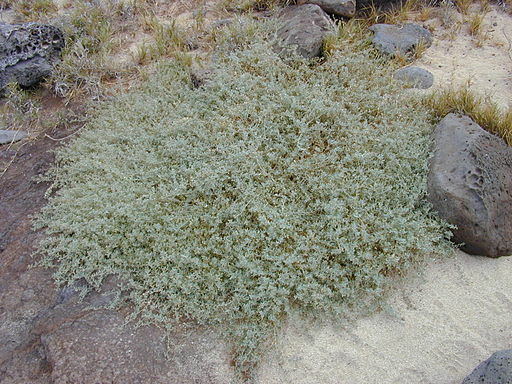 Turns out that this weed hugs the ground in dense mats, suffocating native plants around it. Ours killed a coyote bush plant that was nearing 7 years of age. Animals and birds eat the red berries that the plant produces and, therefore, contribute to its spread. It’s found in soil with a heavy salt concentration with an emphasis on Point Loma, Torrey Pines and even San Marcos Hills. The key to success is removing invasive plants as soon as you see them. The most important thing to do after removing an invasive plant is to immediately replace it with a non-invasive plant to prevent quick reseeding. Mulch bare spots to stifle the growth and test soil frequently as dirt high in nitrogen tends to favor invasive plants. Soil can be amended to decrease the nitrogen content. What plants are you having a tough time getting rid of around your home?